Approximately one in eight women in the U.S. will develop breast cancer. 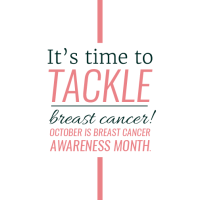 What’s even more frightening, an estimated 231,840 cases of breast cancer are expected to be diagnosed in 2015. Despite these discouraging facts, there are actions you and your loved ones can do to help prevent this disease. Since this is Dr. Co’s blog and October is Breast Cancer Awareness Month, we’re going to share how the benefits of healthy teeth and gums extend far beyond the mouth. Numerous studies have revealed that gum disease can be a link to other ailments, such as diabetes, heart disease, and stroke. An article featured on Healthworks Collective shared a study conducted by the Journal of Breast Cancer Research and Treatment revealing a clear link between periodontal disease and the development of breast cancer. Yikes! As you can see, periodontal disease should not be taken lightly. But, what can you do to stand a fighting chance? Brush twice a day, using a toothbrush and fluoride toothpaste approved by the ADA (American Dental Association). Floss like a boss! Clean between teeth daily with dental floss or another interdental cleaner. Visit your Shoreline dentist, Dr. Co, every six months for a checkup and professional cleaning. By developing a good oral health routine and with the support of Shoreline Dental, the incidence of periodontal disease and other health related issues like breast cancer can be reduced. Be sure to schedule your dental appointment with us by calling 206.440.0065. Are you or a loved one a breast cancer survivor? Leave a comment below – we’d love to hear your story!